This season of THE X FACTOR USA has returned with two old pros, and freshly added two new mentors. The audition tours in night two of Premiere Week lands the mentors in the two cities of Denver, and Long Island. The categories that the mentors will divide contestants into this season are: Boys, Girls, Groups, Over 25s. Mario Lopez returns as the show’s main host. A variety of talent came out of the working dens of everyday jobs such as: restaurant host, subway singer, stock trader, bartender and even an ice cream truck man! They sang their hearts out for the mentors. Sometimes it proved to be worth it, and sometimes not so much. 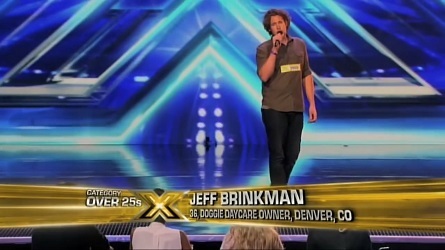 Memorable X FACTOR Moment – Kelly reacting to Jeff saying he owns a doggie daycare. Demi said, “I think you have a beautiful recording voice.” She told him that she believes that he is someone who will sell a lot of records. 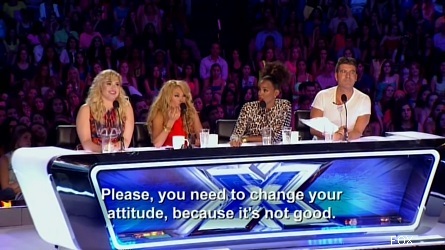 Memorable X FACTOR Moment – Simon walks Jocelyn off of the stage when she won’t stop singing. 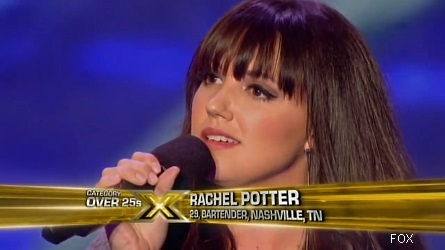 Rachel is a 29-year-old bartender from Nashville, TN. She sang a country version of “Somebody to Love” by Queen. 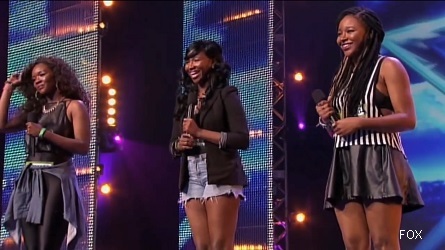 Memorable X FACTOR Moment- The mentors give Rachel a standing ovation. 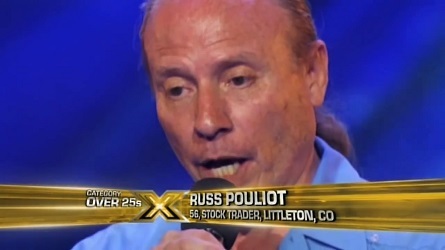 Russell, or Russ is a 50-year-old stock trader who decided to chase a dream and take vocal lessons. He said he’s been singing since 1999. “I am a crooner. I’m going to bring back the love songs.” Russ said he studied four years with a voice coach. 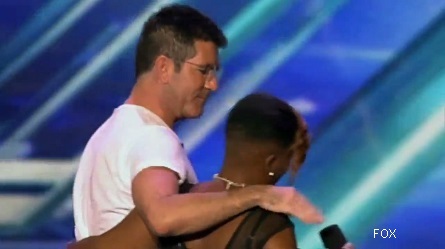 Memorable X FACTOR Moment: Simon does his best Russ Pouliot impression. Paulina said, “I feel a lot of ahh, ahh. Less is more in that.” Simon said, “I liked you. But when you did that you sounded like you were drowning.” Simon said that’s what someone would sound like if they were singing while drowning. “You’re a trier. but not what we are really looking for,” he finished. Demi saw some humor in Russ’s Elvis rendition. She said, “Had you have a British accent, you’d sound like what Simon would sound like if he sang.” That was a challenge that Kelly wanted Simon to fullfill. She asked for a sample. The song started to play again. Russ started singing again. Kelly took the microphone from Russ and gave it to Simon. Then Simon did his best Russ imitation. They are three sisters from Detroit, MI ages 21, 22, 20. Their parents think they’re in New York. They said “this is our last straw.” They probably meant “last chance”. They sang “One Night Only” from Dreamgirls performed by Jennifer Hudson. 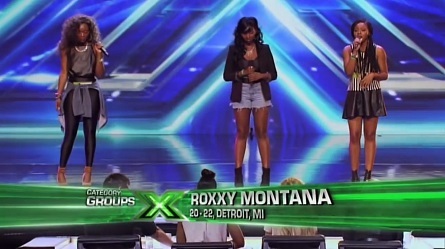 Memorable X FACTOR Moment – When Roxxy Montana got an acapella second chance and scored! Simon was impressed, “You’re really, really good together. But, you’ve got a secret weapon here with this one (pointing to Temptress) on the right. And that’s what every band needs. You have to work it out. It’s about sounding amazing. 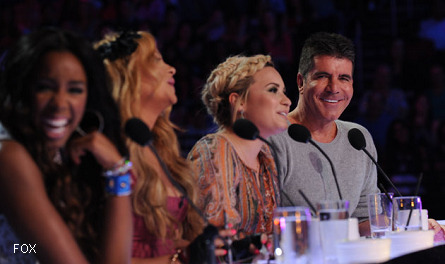 This is potentially the best group that we’ve had on the X Factor.” Simon immediately owned the Group category after Demi said she hopes she gets it. Ice Cream Man for the Ladies! 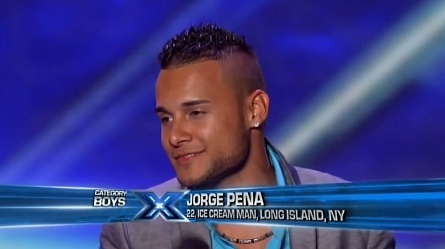 Jorge is a cocky 22-year-old ice cream truck man. He was the first and only Spanish singer of the night. All of the ladies were immediately turned-off by his over-confident attitude, but loved his talent. Memorable X FACTOR Moment – When Paulina told-off Jorge in Spanish! Simon warned him, “seriously for the next two minutes zip it.” Paulina attempted to give Jorge an attitude adjustment in Spanish by telling him to change his attitude and come down from the stars because he’s not a star yet. She voted “yes”. Kelly said “Everything that she said…Se.” Simon put-in a raspberry ice cream order and voted “yes”. 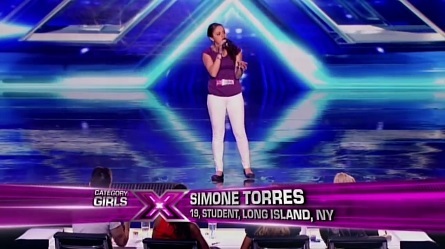 Simone is a young 19-year-old student from Port Jefferson station on Long Island. The crowd cheered in support. 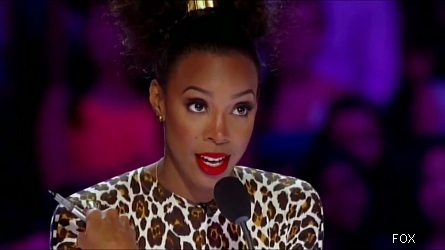 During a behind-the-scenes interview, Simone said, “I like to speed rap. That’s one of my favorite things on stage.” However, she surprised everyone when she started to sing. Simone sang oldie song, “Mustang Sally” by Wilson Pickett. 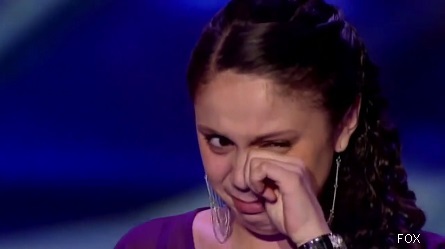 The response from the audience and judges overwhelmed Simone who got emotional. 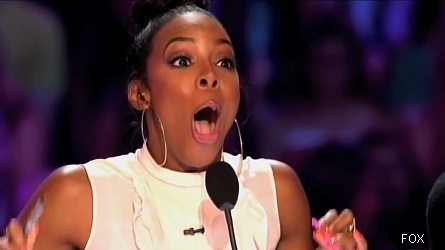 Simone said that her pursuing singing as a career is no longer a dream but something that is now tangible. 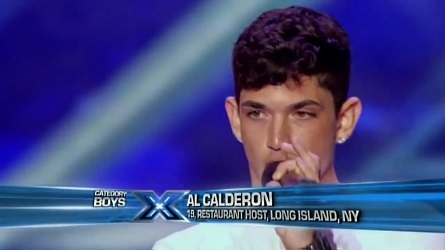 Al is a 19-year-old restaurant host and happy birthday singer. He sang “Sarah Smile” by Hall and Oates. Kelly immediately began to flirt with Al as soon as he came onto the stage by first saying, “Wow, your eyes are beautiful!” After he sang, she said, “I would want you to take me out.” Simon quickly swooped-in to remind her of the age difference, “We don’t have a time machine!” Demi told Simon that time machines don’t travel back far enough for him. Memorable X FACTOR Moment – When Kelly told Al she’d like him to take her out on a date. Just Singing in the Subway! 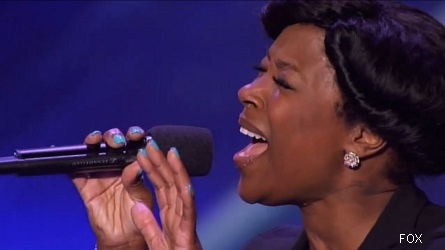 The most touching performance of the night came from 41-year-old New York subway singer Denise Weeks. She sings in New York subways for tips. “I had to put my pride to the side because I need to provide for my kids,” Denise said. 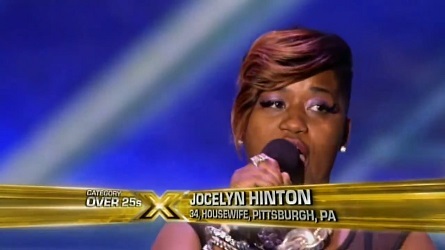 She also explained, “Winning this competition would mean everything to me. It would mean that I would never have to sing in the subway again.” Denise sang, “The Greatest Love of All” by Whitney Houston. 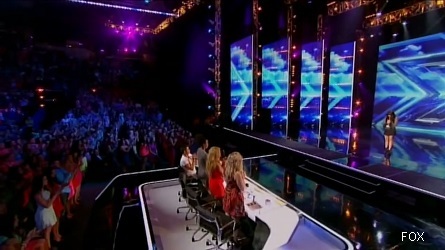 Memorable X FACTOR Moment – After singing without a track, Simon tells Denise The X Factor has been waiting for her. Simon told Denise “you’re rushing it and therefore we’re not hearing any emotion. I’m going to ask you to sing that song without a track.” Her performance was greatly improved, and the mentors were beside themselves by her talent. 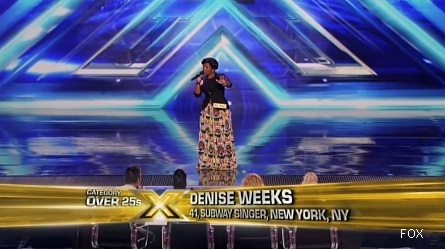 Simon asked Denise, “No one has come up to you and said you should come out of the subways for something bigger?” She answered “I’ve been waiting for The X Factor.” Simon said The X Factor has been waring for you.